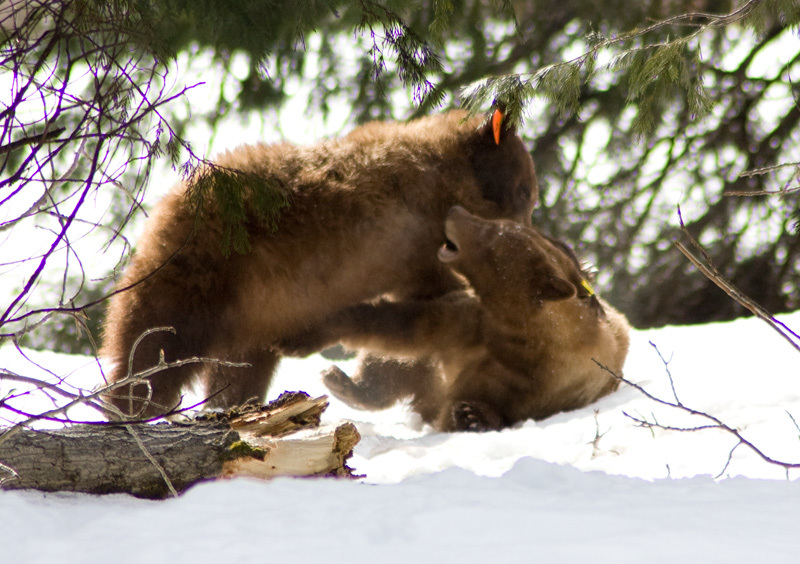 We managed to get a few pictures of them snacking, and wrestling with each other in the woods. I’m not sure why so many of the images turned out fuzzy. I want to blame it on the kit lens, or maybe the lower light levels… In any case, the pics don’t really do justice to the experience of being able to stand (at a nice comfortable distance) and watch these amazing animals. Someday I hope I’ll figure out the photography end well enough to be able to share the experience better. 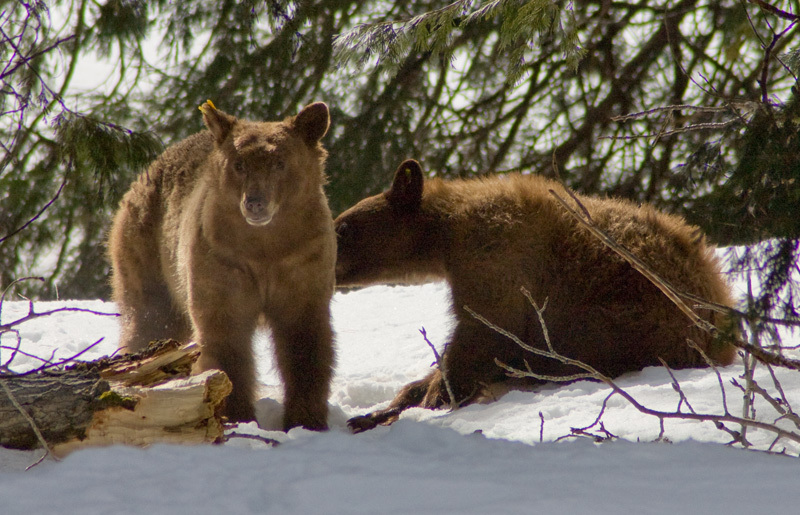 Just a few interesting observations: At one point, the buddy bears decided to wander down to the water for a drink. Passing their footprints later on, we noted how carefully they matched each other’s footsteps, just we were doing in the deep snow. 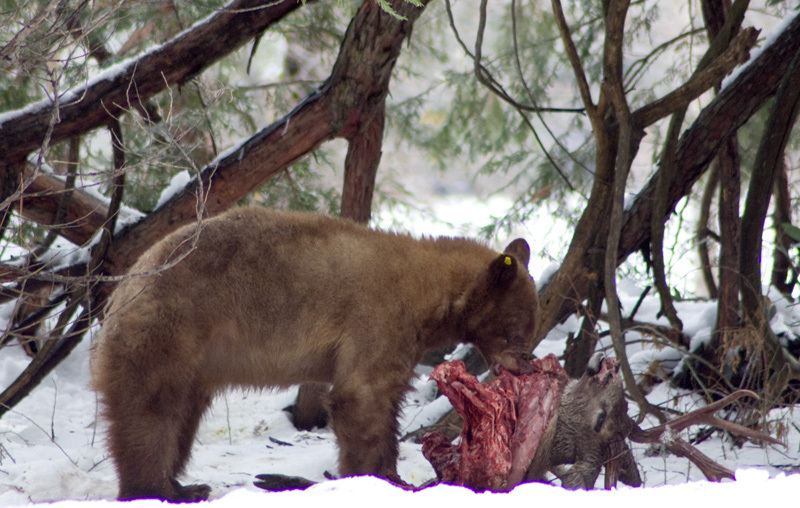 We took a lot of pictures when we saw a bear sitting in the snow a few feet away from the deer carcass, with his hind legs straight out in front, in full on Pooh-bear with a pot of honey posture, regarding a bold raven that had landed nearby. The cutest thing – but none of those came out. At another point, just as we were leaving, one of the bears started lunge and feint at the crowd of ravens that were gathered all around. The ravens would hop back a few feet, and then move forward again as soon as the bear turned away. It reminded me of my fights with the eye-flies on the trails in the summer. Ultimately, mostly futile, but somehow satisfying when I manage to hit one of those irritating bugs. That would have been a sight to see. I wonder what the real relationship is between the bears and the ravens. Oh I didn’t know our black bears ate meat. Yikes! Gently, Anna. I do think it’s interesting to see the wide range of perceptions that people have about wildlife though. Some people are terrified of bears because they see them as giant predators, and others are see them as big harmless teddy bears. It’s amazing how common it is for people to shoot wide of the truth – in both directions. Anna, most Yosemite black bears are vegetarians, so depending on where Mike lives maybe he had no idea. You need to go to etiquette school in addition to elementary school and learn how to use proper punctuation.